I will never understand why so many people think that Wikipedia is OK to use for serious research on the grounds that it is mostly reliable. Mostly? Some years ago I posited the idea of a wiki timetable, in which people get to edit train timetables how they like. 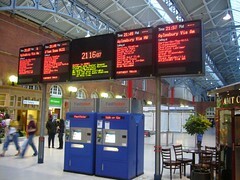 Some of the information displayed on the electronic noticeboards would probably be accurate some of the time. Useful, eh?